Tomorrow's the day - the last Harry Potter book is released, at the stroke of midnight! Well, technically one minute after midnight from what I've read, but still... I'll be there. History in the making. I've been in the mood for sure... re-read books 5 and 6, hy-potter-izing theories for the characters (Snape is only out for himself), and even made two batches of butterbeer the other day (hot and cold!). I'm crazy. After getting the book at midnight and reading all night, it'll be an experience when I go pick up Alice from her spontaneous Alaskan cruise at sunrise on Sunday! I just hope I have enough energy left to join the unholy battle of the cardboard tube ninjas (I know I'm a pirate, not a ninja, but my cardboard tube will be a cutlass and not a samurai). I'm crazy excited! Since I last spat words upon this balrog I've been to San Diego on bidness and the abandoned valleys of Wallowa for the Fourth. I've also been spending a lot of time at Shorty's, my favorite place ever, which has two new amazing pinball games - Pirates of the Caribbean (Yarrrgh!) and Family Guy, which has a mini-pinball game inside of it. Crazy genius! I think I've been working too much, and when I'm not working I'm thinking about working, so I think I need to go into space or the Amazon or someplace that doesn't have a native wi-fi signal. On a side note the town of Wallowa, OR (population 800) has a cell tower now, it's on top of Tick Hill and has given the entire area fantastic coverage. I wasn't sure whether to be really happy or really bummed. 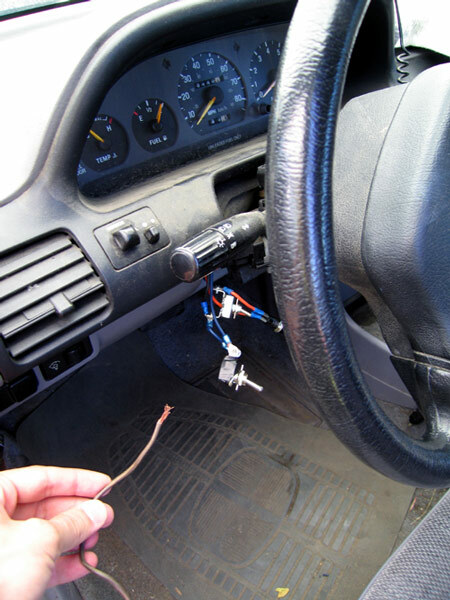 For fun, here's how you start my dad's car in Oregon (just connect the wires, duh!). I suppose in this case it's a 12V, even better! Good use of the double equals. mmm... car + wires + 9v batteries == ZOOOM!